Ann Arbor city council meeting (Nov. 19, 2012): The first meeting of the council’s new edition featured delaying action on two main agenda items – revisions to the Ann Arbor living wage ordinance, and two competing proposals about the city’s public art ordinance. Legislative activity on the public art ordinance resulted from the Nov. 6 rejection by voters of an alternate means of funding public art – a 0.1 mill tax that would have generated roughly $450,000 annually. At the Nov. 19 meeting, Jane Lumm (Ward 2) proposed ending the existing public art program, which requires that 1% of the budget for all capital projects in the city be allocated for public art – with a limit of $250,000 per project. A competing proposal, from Sabra Briere (Ward 1), would narrow the type of capital project from which Percent for Art funds could be allocated. Briere’s proposal would have the practical effect of reducing – by about 90% – the amount of public art funds generated by the existing program. In the last two years the program has generated over $300,000 a year, and more in previous years. The council wound up tabling both proposals, a parliamentary move that means there’s no particular time in the future when the council must consider them. The proposals will expire, if the council does not take them up off the table in six months. However, the council’s strategy will likely be to appoint a committee to study the matter and to suspend temporarily the existing program. A resolution to that effect was added to the council’s agenda during the meeting, after the tabling of the other proposals – but that third resolution was then postponed until the council’s Dec. 3 meeting. Also postponed was a set of revisions to the city’s living wage ordinance. The main change would be to exempt those nonprofits from the ordinance that receive funding through the city’s human services allocation, which has totaled roughly $1.2 million each year for the last several years. The ordinance currently has a waiver provision, requiring a city-council-approved plan for compliance with the living wage ordinance within three years. Only one such waiver has been sought since the living wage ordinance was enacted in 2001. That came at the council’s meeting earlier this month, on Nov. 8, 2012. Based on council deliberations at the Nov. 19 meeting, the living wage revisions in their current form seem likely to be approved only with great difficulty. Some councilmembers seemed more interested in pursuing exemptions for categories of workers – temporary or seasonal – instead of exempting categories of organizations. The living wage ordinance revisions were postponed until Feb. 19. Getting initial approval were changes to two other city ordinances – on noise and the storage of cars on streets. The changes to the noise ordinance were prompted by the impact that recent construction of the Landmark building at 601 S. Forest had on neighbors. If given final approval by the council, the changes would make clear that holidays are to be treated like Sundays and that supervisors can be cited under the ordinance, not just a worker who’s operating a piece of equipment. The revision to the towing ordinance would make it easier to prevent people from storing inoperable vehicles on city streets. Like all changes to city ordinances, it will need a second vote by the council, after a public hearing. In other business, the council authorized a $15,000 budget for analyzing alternatives for installing a sidewalk along a section of Scio Church Road. Residents in the area have petitioned the city for a sidewalk. 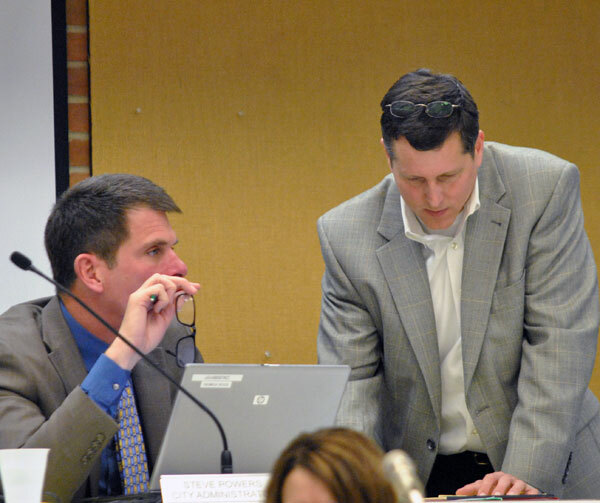 And Stephen Kunselman (Ward 3) used his communications time toward the end of the meeting as an occasion to deliver harsh criticism of the Ann Arbor Transportation Authority and mayor John Hieftje. In the first meeting for newly elected councilmembers, the council also chose Marcia Higgins (Ward 4) to serve as mayor pro tem, as she has for the last three years. The order of succession to the mayor, based on seniority lines, was also set. The council had two items on its agenda related to the city’s public art ordinance. One proposal would have terminated the program, while the other would have narrowed the range of eligible projects. Added to the agenda during the meeting was a resolution to appoint a task force of five councilmembers to study the issue and to suspend the expenditure of funds – with several exceptions – currently allocated for public art. The legislative activity was prompted by a failed public art millage that had been placed on the Nov. 6 ballot. The city’s Percent for Art ordinance currently requires that 1% of the budget for all capital projects undertaken in the city be set aside for public art – up to a limit of $250,000 per project. The proposal to revise the ordinance, sponsored by Sabra Briere (Ward 1), focused on the definition of projects to which the ordinance applies. It also added requirements for public participation. The practical effect of the narrowing of project eligibility in the way proposed by Briere is estimated to reduce the amount of public art funding by about 90%. For each of the last two fiscal years, the Percent for Art program has generated roughly $300,000. If the ordinance revisions had been in place, only about $25,000 would have been generated. Left to right: Ward 2 councilmembers Sally Petersen and Jane Lumm. 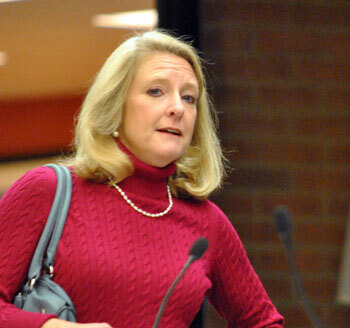 The other proposal, to terminate the program, was put forward by Jane Lumm (Ward 2). She interpreted results from the failed public art millage on Nov. 6 as an indication that voters wanted the existing, non-millage-based program eliminated. The millage failed by a 10-point margin (55.8% opposed and 44.14% in favor). Lumm had described her intent at the council’s Nov. 8 meeting to bring forward a proposal similar to one she’d made on Aug. 20, 2012 – a resolution that directed the city attorney’s office to prepare an ordinance revision that would repeal the Percent for Art program. In an email sent to other councilmembers, Lumm stated that “… the version I will bring forward on 11/19 will be the proposed ordinance changes themselves for consideration at first reading.” The Aug. 20 meeting was the occasion on which the council voted to place a public art millage on the Nov. 6 ballot. It was meant to provide a more flexible funding mechanism for public art in Ann Arbor. The 0.1 mill tax was expected to generate around $450,000 annually. The proposal did not win a majority of votes in any precinct of Ward 2, which is represented by Lumm and – following her election on Nov. 6 – Sally Petersen. Differing interpretations of the expressed voter sentiment that were part of the council’s deliberations on Nov. 19 included the idea that voters were saying something about: (1) the way public art is funded, or (2) whether public money should be used to support public art at all. The proposal to modify the ordinance took a different tack from the one Briere has previously explored. In the past, Briere has proposed ordinance revisions based on restricting the funds from which public art projects could draw. But her proposal on Nov. 19 was to narrow the definition of projects to which the existing ordinance would apply. Currently, the Percent for Art ordinance applies to essentially any capital improvement project undertaken by the city. Briere’s proposal would narrow the definition by restricting eligible capital improvement projects to those that are “intended to be open or visible to the public.” Projects to construct roads, highways, paths, and sidewalks would be eliminated from eligibility. Bridges would still qualify. History of public art funding allocations by year and by fund. Of the roughly $300,000 that’s been allocated to public art through the Percent for Art program in each of the last two fiscal years, about 90% of it has been generated through projects that have been paid for partly out of the street millage fund and the sanitary sewer fund. The two-year total attributable to the street millage fund is about $250,000. For the sanitary sewer fund, the two-year amount is about $180,000. Given the narrowing of the eligible project scope in Briere’s ordinance revision, that money would not have been allocated to public art if Briere’s ordinance amendments had been in place. Briere’s proposal also included a financial threshold for qualifying projects: $100,000. Her proposed ordinance amendments would also require a public process associated with proposed art projects. Part of that process would require notification of the councilmembers in whose ward a project is proposed. Debra Polich introduced herself as a Ward 5 resident who’s worked in the cultural sector for 30 years, and currently works as director of the Arts Alliance. She served with Marsha Chamberlin as co-chair of the public art millage campaign. [Chamberlin, who is retiring as president of the Ann Arbor Art Center, also serves as chair of the Ann Arbor public art commission, which oversees the Percent for Art program.] Polich contended that the election results don’t give a clear reason why the measure didn’t pass. She’d heard people were confused about the ballot language. [The question began with "Shall the Charter be amended to limit sources of funding for public art ... ] The campaign committee also heard that people voted against the millage because they wanted to keep the existing Percent for Art program. The Ann Arbor region is widely recognized as an outstanding arts and cultural community, Polich said, rivaling the offering of cities that are larger and have more resources. Ann Arbor is an arts leader in the region and in the state. And because of that, she said, Ann Arbor is a great place to live, work, play, learn and visit. She asked the council to take time to give some thoughtful consideration to the Percent for Art program. If councilmembers decided to move either of the proposals forward, she asked that 120 days be allowed before the second and final reading, to give some time for discussion and improvement. Margaret Parker introduced herself as co-owner of Downtown Home & Garden with her husband, Mark Hodesh. She noted that she’d chaired the Ann Arbor public art commission for many years and had worked on the millage campaign. She observed that Ann Arbor has been designated as an arts and culture destination by the convention and visitors bureau and by the state’s Pure Michigan campaign. She characterized that as “just one more success” that had come from the city council’s support for art in public places – which had put a beautiful and environmental fountain in front of the city hall that children can plan in, she said. [Parker was referring to the piece by Herbert Dreiseitl.] Parker pointed out that the council had wanted to replace the current program with a voter-approved millage – with only eight weeks for a millage campaign. The failure of the millage meant that the current program is still in place, she noted. She allowed that it might not be perfect, but contended that “it works.” In the last five years, she said, there’s been more public art than ever before in Ann Arbor, and at least 10 more projects are ready to go out the door. Parker invited councilmembers to compare Ann Arbor to other cities in the Big 10 athletic conference. She told them that 10 out of 13 Big 10 states have a statewide percent for art program. Of the 13 Big 10 cities, nine fund public art as well, she said. Of those nine, five use a percent-for-art approach, while the other four use a public-private mix. Michigan has a percent for art law, she said, but it’s optional. Parker contended that by now, Ann Arbor’s public art commission has gotten the hang of the system, and city departments are ready to go, and the community is getting excited, she said. She invited councilmembers to ask neighbors of Allmendinger Park how they like their new mural. She asked what needs to be fixed. She questioned whether now is the time to restrict funding and to add more oversight, by giving the city council more control. She asked councilmembers: “Do you really need more work?” What the city’s public art program really needs, she suggested, is a vote of confidence. Marsha Chamberlin addressed the council as chair of the public art commission and as retiring president and CEO of the Ann Arbor Art Center. She ventured that we can agree that nobody can agree on what makes good public art: Some people love it and some people hate it. But she contended that there’s agreement that public art is good because it attracts people, excites people, generates interesting discussion and serves as a place maker. Public art is an important thing for cities that have an educated and international population, she said. She reminded the council that she’s stood there before to talk about the serious commitment that the city has made to public art by establishing funding through the Percent for Art ordinance. It takes time to make good artistic decisions, she said. It takes time to engineer pieces of art, it takes time to put the legal agreements in place, and it takes time to nurture the community engagement. The commission has done all of that and there are many projects in the pipeline, she said. The important thing is not to rush a decision that negates the opportunity for the future. Chamberlin supported Polich’s request for a delay. 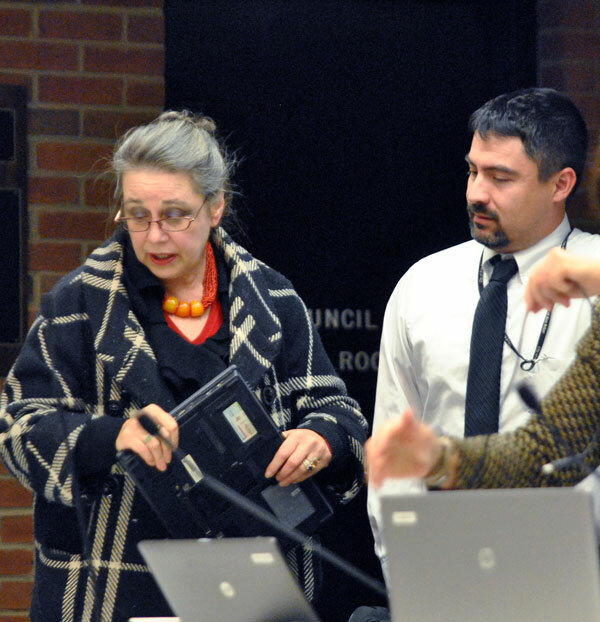 Jane Lumm (Ward 2) led off deliberations by saying that since 2007, when the Percent for Art ordinance had been established, it had been controversial. She reviewed aspects of the program that she described as controversial: the basic premise of public funding of art instead of focusing priorities on enhancing private funding of art; diversion of funds from capital projects to art; and the legal basis of the program, which had never been authorized by the voters. She described the program as plagued by operational challenges, including the requirement that art be permanent and monumental. That constraint on the type of art that could be funded by the program, she pointed out, had been given as an argument for placement of the millage on the ballot. Lumm continued by saying she felt that the art projects produced through the program had been met with less than universal acceptance. She felt that it stretched the bounds of reason to come back after the millage failed to say that the public art program is fine and that it shouldn’t be changed. If it’s the council’s collective priority to publicly fund public art, Lumm said, then it’s up to the council to find some other mechanism to do it besides the Percent for Art program. When the council approved the public art ballot question, Lumm reminded her colleagues, many of them said they were confident that the millage would be approved by voters, but if it didn’t there would be a need to reassess. Lumm anticipated hearing that the vote against the millage was somehow really an endorsement of the existing Percent for Art program, or some other convoluted explanation. She hoped that other councilmembers would agree it’s time to terminate the program. She reviewed how her proposed change would terminate the program effective July 1, 2013. Funding to date would remain in the public art fund, she said. Marcia Higgins (Ward 4) observed that there were questions raised when the council voted to put the millage question on the ballot. There were legitimate questions about what the appropriate funding was. When councilmembers had said if the millage failed it would be time to reassess the public art program, she felt that time was now, and she felt that more time was needed to do that properly. Anglin described the program as having gotten off to a rough start. It’s good to admit mistakes, he said. He felt that the Allmendinger Park mural was a success. He was less confident about the Dreiseitl fountain. “Just admit a mistake and move on; it’s not a perfect project. I walk past it all the time … What I like about it is its purple colors – I couldn’t say anything else.” [The bronze structure includes flashing blue lights that are meant to evoke falling water.] He said he was disappointed with the price tag. [In total, the project cost nearly $1 million.] He said the voters had given a clear message with their rejection of the 0.1 mill public art tax, so he wondered how the public could now be sold on a public funding mechanism for art. Mayor John Hieftje felt that Anglin’s comments supported the idea of tabling the issue. Sumi Kailasapathy (Ward 1) said that when the public art millage was placed on the ballot, two problems were identified with the existing approach: (1) the money has to be linked thematically to the fund paying for the project; and (2) art that’s paid for through the program has to be monumental and permanent. 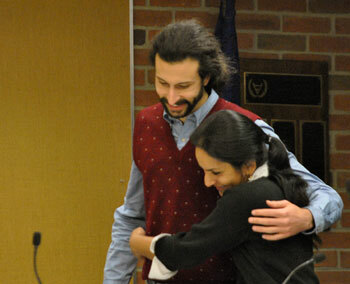 Sumi Kailasapathy (Ward 1) and Christopher Taylor (Ward 3) before the Nov. 19 council meeting started. The public art millage ballot question was pushed forward by Taylor over the advice of the larger arts community. Given that the millage failed, to maintain the existing public art program is problematic, Kailasapathy said. She felt that would undermine the electoral process. She believed that the council should have repealed the existing millage and then put a “clean” proposal before the voters. But the council did not do that. She called the approach the council had taken as “playing games.” She thought that now the council should repeal the ordinance. No one is trying to say that art isn’t valuable, she said. Hieftje noted that the discussion should focus on the tabling, not the merits of the ordinance revisions. Sally Petersen (Ward 2) said she was inclined to think about what it means when voters rejected the millage. She was hesitant to interpret the no vote on the millage as a vote against art in public places. She also was hesitant to interpret the outcome as a yes vote for the existing Percent for Art program. But she noted that the legal effect of the no vote on the millage was to continue the existing program. She said the existing program is problematic and that the council doesn’t know what was going through the minds of the public when they voted on the public art millage. Petersen then delivered a broadly supportive statement about art: “… [A]rt happens in Ann Arbor; every single day, art happens.” She indicated she supported tabling the question, and asked that during the period when the question is on the table, the council take the time to consider it. She asked that during the time of the tabling, any future allocations be suspended that would otherwise be required under the public art program. That would give the council the time to consider what the public is thinking. Councilmembers need to review with their constituents how the city should reflect its support for art. 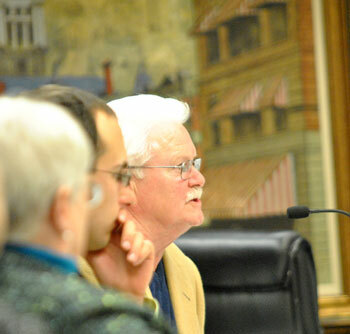 Responding to Petersen’s suggestion immediately to suspend the program, Hieftje noted that even if the proposed ordinance repeal were to pass, it wouldn’t take effect until after June 30, 2013. Higgins indicated that if both questions were to be tabled and both referred to a council committee, she had a resolution prepared that would implement Petersen’s suggestion – to suspend the allocation of funds required by the current ordinance. Lumm said she wouldn’t support the tabling. Like Kailasapathy, she believed that in many ways, public dollars for public art gets to the essence of how we view taxpayer funding of services. She did not feel the community was telling the council “to perfume” the existing Percent for Art ordinance. Sabra Briere (Ward 1) and Paul Fulton, with the city’s IT department. Briere was content to see her resolution tabled as well. One of her concerns, after formulating her proposed ordinance changes, was that there was little opportunity for anyone to weigh in on the possible impact of the changes. She had intended to request a two-month postponement of her own proposal. So she encouraged the tabling of the questions, on the condition that the council held firm on appointing some councilmembers to draft new ordinance revisions – or to decide that this is not the way to go. Kunselman indicated he’d support tabling because it’s important to discuss everything. He wanted everything discussed, not just tweaking. He noted that he’d been one of the strongest critics of the Percent for Art program, because he doesn’t believe it’s legal to take funds that are designated for other purposes and transfer those funds to support public art. He had voted for the original ordinance in 2007 because of the importance of art in the community. He described himself as caught between a lot of emotions. But he didn’t want to vote it up or down without a little more thought. He noted that little time had elapsed since the vote to reject the public art millage and he didn’t want to speculate about what that rejection meant. He wanted a little more time to see the issue discussed thoughtfully. Outcome: The vote to table Jane Lumm’s proposal to rescind the city’s public art ordinance was 8-3, with Lumm, Mike Anglin and Sumi Kailasapathy dissenting. Briere led off discussion of her proposed changes by saying she didn’t think another round of discussion was required. She noted that the council had in the past more than once voted on reducing the funding to the public art program, but those proposals had failed. She took that as a reflection of the community’s strong commitment to public art and to the strong commitment to the public funding of art. She moved to table her proposal, in the event a committee could be established that could make recommendations. 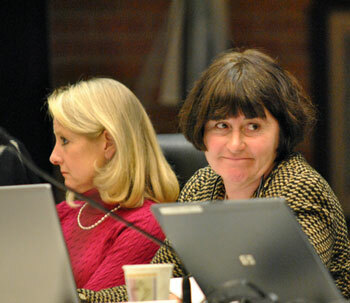 Lumm said she was ready to vote on the proposal, indicating she was opposed to tabling the proposal. She noted that some information had been provided by the staff that made clear that Briere’s proposal would have the practical impact of reducing public art funding significantly. She wanted to know what was supposed to happen while the question was tabled. Briere observed that when the council had voted to table Lumm’s proposal, it had been in the expectation that a committee would be formed to look at the Percent for Art ordinance as well as the ordinance establishing the public art commission and to consider how to go forward from there. It’s possible that the committee’s recommendation would be to eliminate publicly funded art. There would be a lot of divided ideas about the outcome of the election, she said. Considering the issue for a longer time seemed wiser, Briere concluded. Hieftje ventured that what was being proposed with the eventual tabling of both questions was a task force of five councilmembers. Higgins said that the charge to that task force would be imperative. Whether to go forward at all would be very important, she said. She felt the committee needs to consider all the options. She also felt it needs to be done in an expeditious manner. The task force that’s appointed should come back to the council with a recommendation, she said. In her opinion, Higgins said, that recommendation “should be a repeal of the current ordinance, and anything that you think is the right thing to move forward with – or not.” She felt that the council is an intelligent body and is interested in what’s in the best interest of Ann Arbor. Anglin ventured that the task force should have one council representative from each ward. Since a motion that has been laid on the table is still within the control of the assembly, no other motion on the same subject is in order that would either conflict with, or present substantially the same question as, the motion that is lying on the table. To consider another motion on the same subject, it is necessary first to take the question from the table and then to move the new proposal as a substitute, or to make whatever other motion is appropriate to the case. However, if this issue were to have been raised in connection with the city council’s deliberations on Nov. 19, then it would have been proper to raise the point of order immediately when the council reached Briere’s proposal – as Briere’s proposal might have been considered to conflict with Lumm’s, which at that point was already lying on the table. It’s not clear how a council action to postpone Briere’s proposal would have solved the issue of not considering a question with the same subject matter as one already lying on the table. Any discussion of Briere’s proposal at all, including deliberations on postponing it, would appear to violate the prohibition against considering a question with the same subject matter as one already lying on the table. Section 17 deals with Laying on the Table, and in the standard description as to the particular effects of the motion there is some vague and broad language concerning “motions on the same subject.” For that reason, the waiver of the rules was done as a way to simply allow the motions to table to be used as desired, and to preclude any issue. The tabling of the two motions was a way to deal with both proposed ordinances in the same way. Any proscription against this obviously would not make sense. Waiver of the rules ensured this was clear. In the end, it is for Council to use the rules so as to make sense. I did not mean to suggest that postponing the second motion was preferable to waiving the rules, or even required. My only thought about postponing, was that Robert’s Rules about postponing (Section 11 and 14) don’t have the same language as found in Section 17. I did not intend to suggest that such a method was preferable to waiving the rules. Obviously, Robert’s Rules doesn’t state preferences; the language provides procedures. My only intent was to work through those procedures. A rule that could have been applied during deliberations – but was not – was the fact that motions to table are, under Robert’s Rules, not debatable. Considerable discussion was entertained on both motions to table the public art questions. However, because no councilmember objected to the debate of those motions, the discussion continued without a need to suspend the council rules. In enforcing the rules there is a need for the exercise of tact and good sense. In small assemblies, and especially when the members are unfamiliar with parliamentary procedure, a strict enforcement of the rules is unwise. It is usually a mistake to insist upon technical points, so long as no one is being defrauded of his rights and the will of the majority is being carried out. The rules and customs are designed to help and not to hinder business. In light of Postema’s suggestion that either Briere’s proposal should be postponed (as opposed to tabled) or the council rules suspended and Briere’s proposal tabled, Higgins was emphatic in wanting to treat the proposals by Lumm and Briere in the same way. So the council voted to suspend the council rules, and Higgins re-introduced the motion to table Briere’s proposal. Lumm argued again against the tabling. The Percent for Art ordinance didn’t meet her threshold for a taxpayer expenditure, she said. Responding to Briere’s point that 44% of voters had supported the public art millage, she felt that kind of reasoning could be extended to any millage. Outcome: The council voted 10-1 to table Sabra Briere’s proposal. Dissenting was Jane Lumm. Higgins then moved to re-open the agenda to add the resolution she’d alluded to during deliberations on the two public art proposals. That was accomplished over the objection of Lumm, who consistently objects to late additions to the council agenda. It was placed on the agenda in a slot that came a bit later. Higgins read aloud the entire resolution. Key points of the resolution included the suspension of the use of funds for new art projects until April 1, 2013, but it explicitly did not affect projects for which funding had already been approved, like the Kingsley rain garden, or artwork at the East Stadium bridges or Argo Cascades. The resolution included in its “whereas” clauses a statement that a committee had been appointed to make recommendations on the public art program – but no such committee had up to that point been appointed. Christopher Taylor (Ward 3) requested a short recess to sort things out. When the council returned from the break, the consensus was quickly reached to postpone the resolution until Dec. 3, the council’s next meeting. Outcome: The council voted unanimously to postpone Marcia Higgins’ resolution until Dec. 3. The council was asked to consider several amendments to Ann Arbor’s living wage ordinance. The main proposed changes to the law – which sets a minimum wage of $12.17/hour for those employers providing health insurance and $13.57/hour for those not providing health insurance – would exempt from the minimum wage requirements those nonprofits that receive funding from the city for human services work. The current law applies to companies that have contracts with the city for more than $10,000 in a given calendar year, and that employ five or more people (10 or more for nonprofits). The current law also provides an exemption for organizations funded from the city’s community events budget – an exemption put in place to accommodate the Ann Arbor Summer Festival’s practice of paying its temporary employees less than the living wage and the city’s desire to fund the festival at a higher level. Among the other amendments is an increase from $10,000 to $25,000 for the amount of a contract triggering the application of the ordinance. The timeframe would also change from a calendar year to one fiscal year. Also included in the proposed amendments is one that would allow the city administrator to grant a waiver from compliance with the ordinance, instead of requiring the approval of the city council. At its meeting on Nov. 8, 2012, the council had granted such a waiver to the Community Action Network, which receives funding from the city to do human services work. At its Sept. 17, 2012 meeting, the council had considered but withdrawn a resolution that appeared to be an attempt to invoke the waiver clause of the ordinance across all nonprofits that receive human services funding from the city. The move was tantamount to revising the city’s ordinance with a simple resolution, which is not a legal way to proceed. The Sept. 17 resolution was prompted by concerns expressed by CAN, although the resolution did not mention that organization explicitly. The city’s ordinance is likely on dubious legal grounds. A Michigan Supreme Court order from April 7, 2010 left in place an unpublished court of appeals opinion that found a Detroit living wage law to be unenforceable. Ian Robinson introduced himself as an Ann Arbor resident and a teacher in the University of Michigan’s department of sociology. He also noted that he serves on the board of the Sweatfree Purchasing Consortium – an organization he described as one that seeks to encourage state and local governments to purchase supplies from sources that don’t use sweatshop labor. He told the council he opposed the proposed changes to the living wage ordinance – raising the threshold from $10,000 to $25,000 and the exclusion of nonprofits. The ordinance itself isn’t being eliminated, so he interpreted that to mean that the proposer must not be opposed to the ordinance in principle. He felt that the two changes taken together might substantially reduce the coverage of the ordinance, which he said would not be a good thing. It would be good have some empirical data to determine how many contracts are covered under the ordinance, but he assumed that the changes would be large enough to have a significant impact. There are several reasons the city shouldn’t want to change the coverage of the ordinance, Robinson said. First, government is bound by rules to take the lowest bid – rules created to prevent corruption. But that can also have the effect of incentivizing bidders to cut costs by paying sub-living wages, which does not serve the larger public. The best way to prevent that from happening is to put something in the bidding process that neutralizes that potential incentive. When nonprofits are working for the city, they shouldn’t be treated differently from any other employer, he said. When companies pay a living wage, it increases the purchasing power of workers, which increases the purchasing power of the community. He allowed that some nonprofits might have to reduce their employment if they have to pay their workers more, but purchasing power would increase. During the concluding public commentary at the end of the meeting, Michael Benson said that as a student at the University of Michigan, he was glad the issue had been postponed. Commenting on the idea that students don’t need to be paid at the level of the living wage, he said that while it might be true that some students don’t use a wage to support themselves, that wasn’t true of all. About half of the masters degree students at the university receive financial aid, he said. For the half that don’t receive financial aid, it doesn’t mean they don’t need it. Sally Petersen (Ward 2) led off deliberations by disclosing that she sits on the board of the Neutral Zone, which receives funding through the coordinated process for funding human services in which the city of Ann Arbor participates. [The other partners in the coordinated process are Washtenaw County, the Urban County consortium, United Way, and the Ann Arbor Area Community Foundation. For the current 2013 fiscal year, the Neutral Zone was allocated $10,000 from Washtenaw County for its S.C.O.R.E. (School, Career, Opportunities, aRe, Endless) program.] Petersen did not believe that there’s a conflict of interest that would preclude participation in deliberations and voting, but she was declaring the relationship in the event that other councilmembers wanted to vote to excuse her from voting. Lumm reviewed the history of the council’s Sept. 17 agenda item and the wavier granted to the Community Action Network (CAN) on Nov. 8, which she characterized as a “one-off” action. Based on the council’s discussion at the Nov. 8 meeting, Lumm said it was clear that the issue was complex. Lumm said the nonprofit community supports the living wage, but in a challenging economic climate the requirement made it more difficult to maintain programs. Lumm expressed the view that when the ordinance had been enacted, it could not have been anticipated that it would put the city’s nonprofit partners in this kind of difficulty. The need for the human services provided by nonprofits has continued to grow, Lumm said. Since 2008, city funding for nonprofits has dropped by 11% but the living wage specified by the ordinance has increased 18%. She described the situation as a “squeeze” that was resulting in some nonprofits ignoring the living wage ordinance or causing them to drop programs. Other nonprofits are structuring their budgets in a way that segregates employees who’d be subject to the city’s living wage ordinance so that they’re not funded with city money. Lumm indicated that her thinking on this issue was guided by trust in nonprofit human services providers that they’ll weigh the right balance on the question of how much to pay their workers. Christopher Taylor (Ward 3) queried about current legal status of the city’s living wage ordinance. City attorney Stephen Postema seemed keen to discredit the idea that there was a significant question as to the legal basis of the city’s living wage ordinance. Referring to a Detroit case, where the Michigan court of appeals found Detroit’s living wage law to be unconstitutional, Postema said that some people begin to cite a case without realizing it may have no broader applicability. Postema then argued that the Detroit case had no binding effect on the city of Ann Arbor, because the court chose not to publish the case. By way of background, it’s the classification of the case as published versus unpublished that matters, not whether the case is broadly disseminated. In actual practice, however, judges may use the logic and reasoning available in unpublished opinions to inform their thinking about how to correctly analyze a case. And it’s this practical issue that has led many observers to conclude that Ann Arbor’s living wage ordinance is not on a solid legal foundation – not a mistaken belief that the unpublished opinion is binding. Attorneys sometimes rely on unpublished opinions to provide advice to their clients, even if those opinions do not impose a binding precedent. For example, Postema relied on an unpublished opinion in advising the city council that a failure to provide unrestricted access to a special meeting posting for an 18-hour period before the meeting – for an Aug. 29, 2011 session – was not a violation of Michigan’s Open Meetings Act. The provisions of this constitution and law concerning counties, townships, cities and villages shall be liberally construed in their favor. Powers granted to counties and townships by this constitution and by law shall include those fairly implied and not prohibited by this constitution. However, a Michigan Supreme Court order from April 7, 2010 declined to hear the appeal on the Detroit living wage case, leaving the court of appeals ruling to stand in that case – a result that’s led many observers to conclude that a challenge to Ann Arbor’s living wage law would be struck down at least initially and would require an appeal to the Michigan Supreme Court to maintain it. As a practical matter, that kind of challenge is unlikely to come from the set of nonprofits to which the city provides human services funding. In his remarks to the council, Postema characterized the Detroit living wage case as “sort of a historic relic.” The general rule, Postema said, is that an unpublished case has no precedential effect. Postema said that in his view, the court of appeals was not required to follow the 1923 Supreme Court precedent that it felt it was bound to follow. The Supreme Court, Postema said, had allowed the unpublished case to stand, which left people to wonder about it, and to “spread information about it that is sometimes incorrect,” he said. 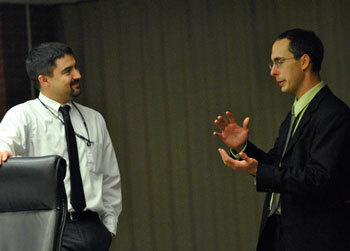 Left to right: city administrator Steve Powers and CFO Tom Crawford. Stephen Kunselman (Ward 3) asked about the city’s enforcement of its ordinance. The city’s CFO, Tom Crawford, explained that enforcement is based on complaints – which are forwarded to the city’s purchasing office when someone believes there’s a violation of the city’s living wage ordinance. In the last couple of years, he said, he was aware of one complaint, which had been investigated and found not to be a violation. Responding to follow-up from Kunselman, Crawford confirmed that enforcement is complaint-driven and that he wasn’t aware of any complaints that found a violation – but he couldn’t speak to the entire 10-year period since the ordinance had been enacted. Kunselman followed up with Postema on the enforcement question. Postema said there’d not been enforcement action, although he’d heard some allegations. He wasn’t aware of any violations. Sabra Briere (Ward 1) recalled that she had worked for a nonprofit, and when that organization had a contract with the city, it had to agree to pay the living wage, post the current living wage amount on bulletin boards where it could be read, and to report what wages it was paying to the city. She had written those reports, so she remembered it, Briere said. So Briere wanted to establish that the lack of enforcement activity that Crawford and Postema had described did not mean there’d been a failure to ask for that documentation. Crawford returned to his point that the process was primarily complaint driven – and if the purchasing office does become aware of something, they do pursue enforcement. “We will not contract with an organization that is not in compliance,” he said. He was not sure how many companies might start the bidding process and not finish it because they weren’t in compliance – but was not aware that it was a large or frequent number. Briere imagined from Crawford’s remarks that few complaints had been received and that no contracts had been cancelled as a result of proving a case that an organization wasn’t paying the living wage. Briere ventured that the city required the same thing from for-profit and nonprofit organizations. Crawford responded by saying that the city is very clear about its requirements. Briere concluded that it would be misleading to say that the city has not enforced the ordinance. Crawford provided some support for Briere’s comment by saying he was aware of some companies saying they would not submit a bid because of the city’s living wage requirement. In terms of “enforcement,” Crawford said, the city documents well what it expects, and that results in companies sometimes deciding not to pursue a contract. Briere finished out her speaking turn by saying she was happy the city did not have sufficient staff to go look at every contractor’s books to verify living wage compliance. Margie Teall (Ward 4) mentioned that during the council’s previous deliberations on Nov. 8, there’d been a lot of discussion of part-time and seasonal positions. She observed that there was no mention of that kind of position in the ordinance revisions. Lumm responded to Teall by re-stating that the ordinance revisions address a category of nonprofits – those that receive funding from the city to do human services work – that also tend to hire part-time and seasonal workers to do a lot of their work. Teall noted that the exemption granted to those nonprofits is not limited to just positions that are part-time, seasonal or temporary. Lumm confirmed that was the case and compared it to the 2008 revision to the ordinance that exempted those organizations that are funded from the community events fund. Kunselman noted that the proposed ordinance revision exempted a class of organizations. He wondered if that violated the equal protection clause of the constitution. Postema offered to provide further information on that before the council considered the ordinance at second reading. Postema said there needs to be a reason for exempting a particular class of organization. Mike Anglin (Ward 5) asked if Lumm’s intention was to deal with the issue on a contractual basis. Some back-and-forth then took place between Anglin, Lumm, and Mary Jo Callan – director of the city/county office of community and economic development, which oversees the coordinated funding process. The discussion centered around Anglin’s question about handling things at a contractual level. Anglin asked if the idea was that a nonprofit would approach the city and say that due to economic hardships, they were proposing that the living wage would not be paid to a specific list of employees: “We’re going to hire 15 employees to teach reading at this pay scale.” He ventured that this would be clear, if it were included in the contract signed by a human services nonprofit. Anglin wanted to know if that was the kind of mechanism that was being proposed. Callan responded by saying that she was not sure she understood the question – as all the work is done through contracts. Anglin observed that CAN had come back and said it couldn’t fulfill the contract – so he wanted to know if this was now the proposed vehicle that would be used. Callan said that as far as the mechanism goes – by which a nonprofit would share its hardship – she explained that a nonprofit completes a “self-survey” indicating that it’s paying the living wage. In order to execute a contract, she explained, the nonprofit has to self-certify that it’s paying the living wage. In the case of CAN, that triggered a process of applying for a waiver. Marcia Higgins (Ward 4) indicated she didn’t think the intent was to exempt all employees for a nonprofit. She’d heard from some people who were part of the effort to establish a living wage 10 years ago, who were really concerned about exempting a whole class of employers. The ordinance was aimed in part exactly at these nonprofits, Higgins said. If the council was going to say that the living wage didn’t apply to certain kinds of workers, she said, that would have to be spelled out in the ordinance. It’s not something that can be done administratively, Higgins said. Higgins ventured that she and mayor John Hieftje were the only two councilmembers still serving on the council who had voted to establish the living wage ordinance. A concern at the time was that everything looks great on paper, but after implementation there might be some evidence that the council didn’t get it right. But at the time the council felt that they’d hear about it if the nonprofits were being harmed by the living wage ordinance. After implementation, the council hadn’t heard that the living wage ordinance was doing harm to the nonprofits. She indicated that the issue was supposed to be monitored, but she was not aware that the question of harm to nonprofits had been pursued. 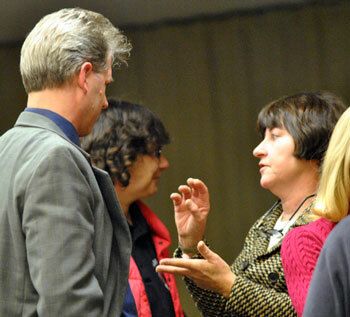 Higgins felt that Lumm had brought up a good issue, but she was not ready to move forward with it. Callan responded to Higgins by indicating that the question of the possible harm to nonprofits done by the living wage ordinance has not been revisited. Higgins indicated her disappointment at that. Higgins said she was dismayed about what CAN executive director Joan Doughty said at the council’s previous meeting about many nonprofits who receive funding from the city for human services work. Doughty had indicated that many nonprofits are not paying the living wage to some of their workers. So Higgins wanted to know what the checks-and-balances process was. Callan echoed the description that Crawford had given, saying that the process is complaint-driven. It’s basically the honor system, she said. There’s not a separate monitoring process for the living wage. When her office monitors an agency, they look for the living-wage poster that’s supposed to be placed in a visible spot, but Callan said her office doesn’t monitor every agency every year. Callan said she thinks that nonprofits are paying the living wage – because she hears how “tortured” they are as a consequence of having to pay it. Nonprofits take contracts with the city or county seriously, she said. She allowed it was possible that there were some nonprofits that did not pay the living wage. Callan told Higgins that the expectation of help from her office with a business plan is an appropriate one. She allowed that CAN’s application for a waiver did languish and she took that on her shoulders. She said that CAN’s plan was written with strategic intent, which was separate from offers to work on sustainability and capacity building. Higgins said she appreciated Callan’s candor. Before the meeting, Sumi Kailasapathy (Ward 1) gets a hug of support from Washtenaw County commissioner Yousef Rabhi, who was re-elected on Nov. 6 to represent District 8 in Ann Arbor. Sumi Kailasapathy (Ward 1) observed that the living wage is supposed to help the most vulnerable – so she wanted to know if an exemption from the living wage applied to just the lowest-paid workers, or if there was a wage freeze across the board. Callan responded by saying that the exemption sought by CAN was the first one to be requested – and her office doesn’t certify that an organization cannot pay the living wage, but rather only that they are paying it. If the organization certifies that it’s paying the living wage, then she executes the contract. Chuck Warpehoski (Ward 5) noted that the current hourly rates specified in the city’s living wage ordinance [$12.17/hour for those employers providing health insurance and $13.57/hour for those not providing health insurance] worked out to about $24,000-26,000 annually for a full-time employee. Callan confirmed for Warpehoski that such an employee would be eligible for support through the city’s human services nonprofits. She said that most people who work in the nonprofit sector would be eligible for such services, as would many city and county workers. Kunselman wanted to hear why it took so long for any nonprofit to seek a waiver from the living wage ordinance. Was it because the process is so arduous? He wondered if it would solve the problem to tweak the ordinance – by exempting just part-time or seasonal employees. He felt that might be a better way to go. Together with the proposed ordinance revision to allow the city administrator to grant an exemption, he felt that would result in a greater use of exemptions and better compliance. Callan told Kunselman that the nonprofit sector is squarely in favor of the living wage – and no director of a nonprofit wants to stand in front of the cameras and say, “I don’t want to pay the living wage.” Kunselman wondered if granting an exemption for nonprofits’ seasonal workers would create an incentive to hire seasonal workers. Callan’s response indicated that she didn’t think so, noting that the nonprofit sector is about empowering people. Living Wage: Council Deliberations – Who Supports? Hieftje indicated he couldn’t support the ordinance revision. The issue had been the subject of great discussion when the ordinance was passed. He reiterated Warpehoski’s point that someone who’s making the living wage qualifies for human services. One of the big worries at the time was that exclusion of part-time workers would encourage the hiring of those workers to get around the ordinance requirements. He observed that it’s taken “all these years” before a nonprofit asked for an exemption, yet the council was now discussing major changes to the ordinance. Many people who work for human services organizations are themselves on the edge of being clients, he said. Hieftje then responded to criticism that the city has exempted itself from the living wage ordinance. But he contended that the city had recognized that it could get on a path to bring those workers up to a living wage standard, and gave two examples of having done that: workers at the materials recovery facility (MRF) and employees who work in the public parking system. Hieftje characterized the changes as chipping away at the living wage ordinance, thus weakening it as a standard of pay. Lumm elicited from Crawford that fact that a company in Texas had inquired about responding to a city contract for call center work. The company had pointed out that the cost of living in Texas was different than in Ann Arbor. Crawford said the company had been told that this was nevertheless the city ordinance. He didn’t recall if the company had bid on the contract, but he didn’t think so. Some back and forth between Teall and Lumm focused on the previous exemption – which does not name the Ann Arbor Summer Festival but rather any organization that receives funding from the city’s community events fund. Teall called it a difficult vote and wanted to look more seriously at limiting it to part-time, temporary employees. What made her inclined to support the changes is the difference between nonprofits and for-profit entities. Briere returned to her perspective of having worked in the nonprofit sector, saying the impact of being paid a living wage was enormous. Knowing that you were one step above poverty was better than being paid a minimum wage, she said. For people who had to support children, the extra couple of dollars an hour made a tremendous difference. Most people who work for nonprofits didn’t do it for the money, she said, but rather because they are passionate about what they are doing. Briere noted that a question had come up at the council’s previous discussion about the applicability of the living wage ordinance to college students – with an accompanying assumption that college students are wealthy. Briere felt that a college student who was doing an internship at a nonprofit was not necessarily wealthy. Briere indicated she wasn’t inclined to support the ordinance revisions. Petersen indicated she’d be inclined to take it to second reading, with a focus on seasonal or part-time employees. A nonprofit is a professional business organization like any for-profit enterprise, she allowed, but she didn’t think that a consequence of an exemption would be to lowball salaries. Nonprofits know that employees can go elsewhere. She’s concerned that nonprofits might meet the living wage requirement by cutting services. Christopher Taylor (Ward 3) echoed the sentiments of Petersen, agreeing that there’s tension between an important social justice issue and the need to maximize services. People should receive a living wage, he said, but he wasn’t certain that the proposed revisions were exactly the best means to support it. However, he indicated support for advancing the revisions to a second reading. Kunselman indicated he’d support moving the proposed living wage ordinance changes to a second reading but wouldn’t support the changes as written, characterizing them as too far reaching. He wanted to look for ways of finding a middle ground on part-time and seasonal workers. He characterized as a failure of the ordinance the fact that there’s been only one nonprofit has applied for an exemption waiver in 10 years. He looked forward to discussing amendments that deal with the exemption section – like giving the city administrator the authority to grant exemptions. Kailasapathy also indicated her support to move the changes to a second reading. She indicated she didn’t worry as much about a nonprofit taking unfair advantage of workers as she might about a for-profit company. Anglin ventured that many nonprofits have left the field. He said he receives much more mail soliciting donations than he ever has before. He noted that the council has directed nonprofits to share resources and has asked them to get lean. Callan noted that she’d only been working in the county/city office for community and economic development for five years – but she’s seen a handful of nonprofits become defunct. Warpehoski ventured that a lot of unanswered questions remain, some related to whether workers are part-time or seasonal. The council had heard from CAN that their after-school workers weren’t in need of being paid a living wage, because they weren’t trying to make a living. He felt like this would be a difficult issue to address. He wondered if it would be possible to refer the question to a committee of councilmembers or others and work it out. Hieftje told Warpehoski that there were several options. The ordinance changes could be passed at first reading with a second reading and public hearing set two months from now. He also said if the ordinance changes were voted down, then the issue might continue to simmer for quite some time. Left to right: Paul Fulton, with the city’s IT department, and Chuck Warpehoski (Ward 5). Briere got Hieftje to confirm that the council’s action on the ordinance revisions could be delayed and referred to a committee or commission. Briere noted that in the five years she’s served on the city council, the council has endeavored to hold steady on human services funding. But if you hold steady, you are losing ground, she said. The problem is that Ann Arbor is expensive. Part of the reason the living wage ordinance was enacted was because of the expense of living in Ann Arbor. She noted that the city is funding human services less fully than what might be ideal, but the solution is not to cut wages, she said. Higgins asked Crawford what the current funding level for human services is. Working from memory, he said that it was around $1.3 million. Higgins recalled in the early 2000s the city was allocating around $1.1 million. And Mike Reid, who represented Ward 2 at the time, had led a move to raise that allocation by $250,000. Higgins noted that the human services funding comes from the city’s general fund. She wouldn’t look to lower it, but wanted to observe that Ann Arbor is one of the few communities in the state that funds human services at all. Higgins still had some real questions, and expressed a desire to have HHSAB weigh in on the question. She suggested a postponement until the council’s second meeting in February to give HHSAB a chance to do that. Callan indicated that some amount of time would be needed to weigh in and offer recommendations. A consensus quickly emerged at the table to postpone the question of revising the living wage, with a request that HHSAB give the council advice on the subject. Outcome: Consideration of the changes to the ordinance was unanimously postponed until the second council meeting in February 2013 and referred to the city’s housing and human services advisory board for more study in the meantime. The council was asked to give initial approval to a change to the city’s towing ordinance that makes it more difficult to store cars on the streets of Ann Arbor. If a vehicle appears to be inoperative based on outward appearance or otherwise appears to not have been driven after a 48 hour notice has been affixed to the vehicle pursuant to section 10:136, the city administrator or his/her delegate may demand that the registered owner demonstrate that the vehicle is operative. Failure or refusal to demonstrate that the vehicle is operative shall be considered conclusive proof that the vehicle is inoperative. The scant deliberations on the ordinance included a request from Stephen Kunselman (Ward 3) that both ordinance sections that were being changed should be mentioned in the agenda item. Left to right: Stephen Kunselman (Ward 3), Ann Arbor firefighter Amy Brow, and Jane Lumm (Ward 2). Kunselman wanted to highlight a change to the heading of an ordinance section, from “Abandoned Vehicles” to “Storage of Vehicles.” Kunselman felt that the word “abandoned” created confusion. What’s really being addressed is not people abandoning vehicles, but rather people using the city streets as storage, by leaving them longer than the 48 hours allowed by state law. Sabra Briere (Ward 1) added that the ordinance change is meant to tackle one set of problems related to towing. The council is not trying to legislate relationships among neighbors, she said. Outcome: The council gave unanimous initial approval to the changes to the towing ordinance. The council was asked to give initial approval of a change that strengthens the city’s noise ordinance. The amendments to the ordinance, sponsored by Ward 3 councilmember Christopher Taylor, were related to the now-completed construction of The Landmark at 601 S. Forest, an apartment building located in Ward 3. Construction noise was one of several aspects of the construction activity that came under sharp criticism at the council’s Oct. 1, 2012 meeting from nearby resident Eleanor Linn. Linn also addressed the council at the Nov. 19 meeting. The persons to whom this subsection applies shall include, but not be limited to, construction managers, foremen, property owners, developers, contractors, and subcontractors who direct, order, require, authorize, or commission another person to perform these activities in a manner that violates this section. If the person is an entity, this subsection shall also apply to the officers, directors, partners, limited liability company members, or other individuals constituting such entity. Eleanor Linn reprised comments she’d made at the council’s Oct. 1, 2012 meeting about her experience living near to the site of the Landmark building construction, which was recently completed. 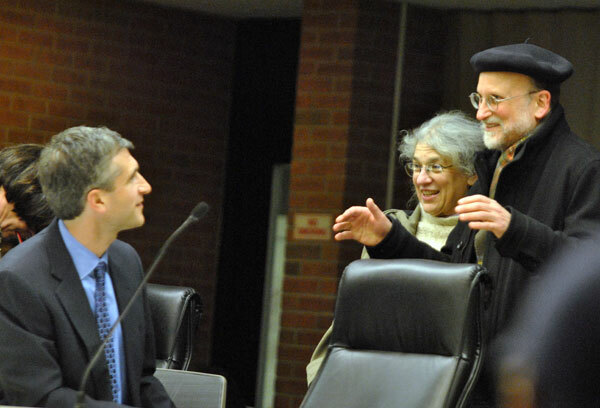 Residents Eleanor Linn and Marc Gerstein chat with councilmember Christopher Taylor (Ward 3) before the council’s Nov. 19 meeting. She supported the amendments to the noise ordinance, and related specific anecdotes that supported the two revisions. On Memorial Day she was awoken at 7 a.m. by construction noise, and learned that the code doesn’t explicitly state that holidays are to be treated just like Sundays. And on another occasion, when construction noise was continuing past the time limit, a police officer was reluctant to issue a ticket – because the citation would go to the person doing the work, not the supervisor. Linn thanked Christopher Taylor (Ward 3), in whose ward the construction took place, for moving the ordinance change forward. Taylor summarized the changes to the ordinance, characterizing them as modest but important for residents who are affected by construction activity. Outcome: The council voted unanimously to give initial approval to the revisions to the noise ordinance. To be enacted, the initial approval by the council will need to be followed by a second approval at a subsequent meeting, following a public hearing. Around 75 residents submitted a petition to the city in August requesting that the lack of sidewalks along the stretch be addressed. Margie Teall (Ward 4), in whose ward the stretch is located, mentioned the lack of sidewalks along Scio Church during deliberations at the council’s Sept. 17, 2012 meeting. At that meeting the council considered, but rejected, a proposal from Mike Anglin (Ward 5) to enact a general plan to fund a program for eliminating sidewalk gaps. On approval of the project budget, city staff are supposed to develop conceptual alternatives and rough cost estimates. Those alternatives and costs will then be presented at a public meeting for discussion and input. After getting that feedback, city staff would make a recommendation to the council and possibly proceed with development of a final design. Peter Hauk introduced himself as a resident of the Churchill Downs neighborhood. He had circulated a petition asking that a sidewalk be installed on a stretch of Scio Church Road near his neighborhood. Seventy-five of his neighbors had signed the petition, he said. A lot has changed since the neighborhood was built. More residents live west of town, which means there’s more traffic along Scio Church. Important destinations are nearby, like the Ice Cube and the Pittsfield branch of the Ann Arbor District Library. Lately there are a lot of young kids in the neighborhood, including his two daughters, Hauk said. On his court there are eight houses, and there are 10 kids under the age of 18, he reported. There had been only one child under 18 when he moved into the house 12 years ago. He’s looking forward to a time when his kids and everyone else in the neighborhood have a safe pedestrian route to nearby destination. So he asked the council for their support of the resolution. During public commentary at the end of the meeting, Michael Benson spoke more to the general issue of sidewalks. As the city replaces sidewalk slabs, he said, it might be worth looking at inserting re-bar in the slabs to improve durability. Margie Teall (Ward 4) noted that the resolution simply established a process to look at how a sidewalk might be installed and authorized a budget for a study. Sabra Briere (Ward 1) said she supported the resolution and noted that there was a demand for a lot of sidewalks in a variety of locations. Ann Arbor is lucky that in a town that was not really built for pedestrians, she said, so many people want to be able to walk to their destinations. Outcome: The council unanimously approved the Scio Church sidewalk study. Patti Smith was nominated as a replacement for John Koupal on Ann Arbor’s environmental commission (EC) – for a three-year term. 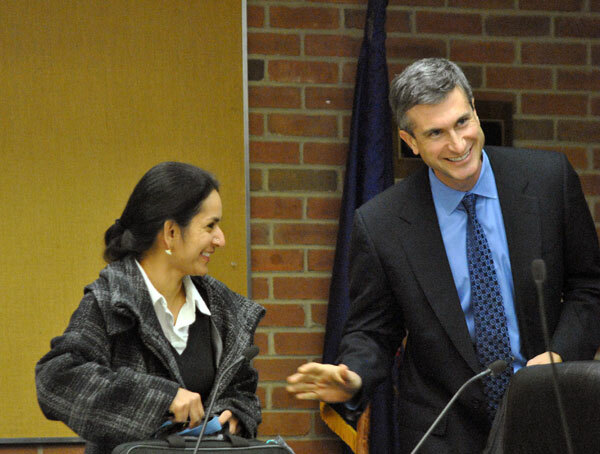 Sabra Briere (Ward 1), the current Ann Arbor city council appointee to the commission, put Smith’s nomination forward. The commission provides advice to the city council on “environmental policy, environmental issues and environmental implications of all City programs and proposals on the air, water, land and public health.” Smith’s educational background is as an attorney, and she now works in the field of special education. Unlike the majority of nominations to city commissions and boards, which are made by the mayor and confirmed by the city council, the environmental commission nominations are made by the council. 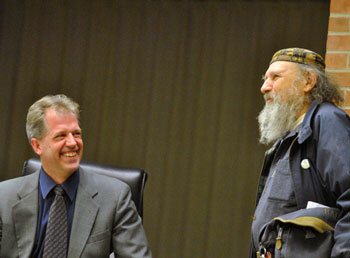 The vote on Smith’s appointment will come at the council’s next meeting, on Dec. 3. Sally Petersen (Ward 2) then noted that Smith already serves on the city’s commission on disability issues, which is listed on her application. Also listed on her application is an interest to serve on the historic district commission. Petersen observed that Smith was being nominated to serve on two bodies – RAC and EC – that were not listed on her application for service. [It emerged in subsequent conversation that the city uses a single one-size-fits-all application form.] While Smith might be eager to serve, Petersen wondered if there might be a limit to the number of boards and commissions someone can serve on. In support of Smith’s nomination to the environmental commission, which was not listed on Smith’s application, Sabra Briere (Ward 1) indicated that when the vacancy on the EC had been announced several months ago, Smith had immediately contacted Briere and indicated her interest in serving on that commission. It had taken some time for the council to move forward with that, but in that time Smith’s eagerness to serve on the environmental commission had not diminished, Briere said. She allowed that it’s unusual to find someone who’s willing to take on as big a load as Smith is, but Briere did not feel that indicates an inability to do the work. 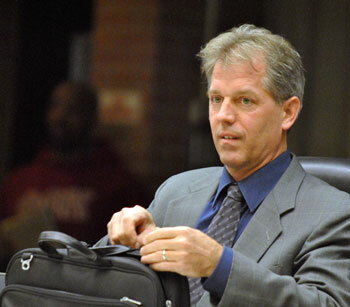 Outcome: The council is expected to vote on Smith’s appointment at its Dec. 3 meeting. Kunselman said he wanted to point out some problems related to the communication that the Ann Arbor Transportation Authority had sent out. A letter dated Sept. 28, 2012 – sent to the city of Ann Arbor as well as all other jurisdictions in the county – stated that requests to withdraw from the new transit authority after Nov. 2 would be null and void. [That timing was keyed to a 30-day window starting from Oct. 3, 2012, when the new authority was incorporated.] A follow-up communication from the AATA and Washtenaw County indicated that the first letter had raised a legal question and that additional time would be given. The letter from the Washtenaw County administrator had indicated that the first letter was not the official 30-day notice. He said he didn’t have anything specific in mind as a way to address the issue. [One option he has reportedly weighed is to ask for the resignation of all AATA board members.] But he wanted to see something that shows the AATA leadership is cognizant of the error, that shows humility, and that will “restore the credibility of their way.” He stated that he does not have the confidence in the AATA’s leadership to move forward with the council’s direction given at the Nov. 8 meeting to work with other urbanized communities to improve transit. 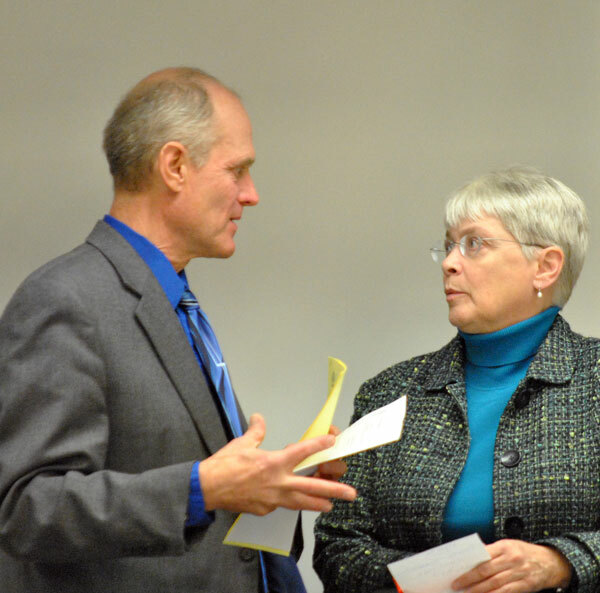 The AATA has yet to “make amends” for the error, Kunselman said, and until the AATA makes amends, he’s deeply embarrassed as an elected official of Ann Arbor who has to oversee the AATA leadership. He again indicated that he did not have an answer but had some ideas. He noted that Marcia Higgins (Ward 4) had suggested at the previous meeting that the city council should meet with the AATA leadership – and Kunselman said that could take place in the context of some kind of work session. The AATA needs to own up to the error that it made and recognize that they had no authority to write that letter, Kunselman said. When he saw the sentence about the Nov. 2 deadline, he said, it “just sent chills down [his] spine” because he knew that it was not true. He said the AATA needs to do something to restore credibility to the organization. Until the issue is resolved, he won’t have any confidence in the AATA. He noted that one of the AATA board members is also a city staff member – Eli Cooper, who would have occasion to appear before the council as the city’s transportation program manager. Following up on Kunselman’s remarks, Sumi Kailasapathy (Ward 1) said she’d received several requests from residents for accountability from the AATA. She wanted to know how much it cost for the planning, marketing and advertising for the countywide effort. On the council’s agenda was the election of a mayor pro tem and the order of succession to the mayor. 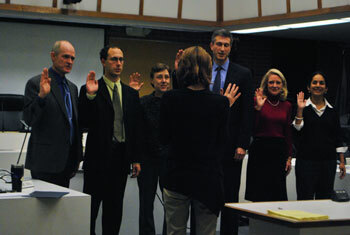 According to the city charter, the Ann Arbor city council must elect from its members a mayor pro tem “at its first meeting after the newly elected members have taken office following each regular city election …” That meeting was Nov. 19 – the first meeting for new councilmembers who won their seats in the Nov. 6 general election. Mayor John Hieftje and Marcia Higgins (Ward 4). New councilmembers include: Sumi Kailasapathy (Ward 1), Sally Petersen (Ward 2) and Chuck Warpehoski (Ward 5). Petersen won the August Democratic primary against incumbent Tony Derezinski, while Kailasapathy and Warpehoski won their respective Democratic primaries against Eric Sturgis and Vivienne Armentrout, when incumbents Sandi Smith and Carsten Hohnke did not seek re-election. Petersen and Kailasapathy were unopposed in the general election, while Warpehoski prevailed against Republican Stuart Berry. The mayor pro tem acts as mayor when the elected mayor is unable to do so. Mayor John Hieftje won election on Nov. 6 for a seventh term, against independent Albert Howard. When acting as the mayor, the mayor pro tem enjoys all duties and responsibilities of mayor except that of the power of veto. With respect to other duties and responsibilities of the mayor as compared with other councilmembers, they consist largely of serving as emergency manager, making nominations to boards and commissions, presiding over meetings, and fulfilling a ceremonial function. The mayor pro tem’s salary is the same as other councilmembers – $15,913 per year. Although the local officers compensation commission recommended in 2007 that the mayor pro tem be given additional compensation, the city council that year rejected that part of the commission’s recommendation. The order of succession to the mayor considered by the council adhered to the same principles as it has for the last several years. It’s seniority-based with a secondary sorting based on alphabetical order by last name. The order of succession, with the councilmember’s year of election, is as follows: Margie Teall (Ward 4 – 2002), Mike Anglin (Ward 5 – 2007), Sabra Briere (Ward 1 – 2007), Christopher Taylor (Ward 3 – 2008), Stephen Kunselman (Ward 3 – 2009), Jane Lumm (Ward 2 – 2011), Sally Hart Petersen (Ward 2 – 2012), Sumi Kailasapathy (Ward 1 – 2012), and Chuck Warpehoski (Ward 5 – 2012). The nomination of Higgins as mayor pro tem was put forward by Taylor. She has served in that capacity since Christopher Easthope left the council in 2008. Except for Higgins’ observation that the compensation for mayor pro tem is the same as for other councilmembers – despite some perception to the contrary – there was no discussion on the question. Councilmembers were sworn in without incident. Outcome: The council voted unanimously to adopt the order of succession and to have Higgins serve as mayor pro tem. Blaine Coleman passed out a copy of an Interfaith Council for Peace and Justice (ICPJ) resolution passed in 2003 that called for arms divestment and cessation of U.S. military aid to Israel. Coleman note that newly-elected Ward 5 councilmember Chuck Warpehoski is executive director of ICPJ, which Coleman described as the only visible peace group in Ann Arbor. Coleman said he wanted to put Warpehoski on the spot and ask him when he was going to enforce the resolution. The resolution pledges the ICPJ to push the city of Ann Arbor to divest from companies that support the Israeli military. Coleman continued by saying that right then that night, “Israel is bludgeoning Gaza.” He described the situation as the fourth biggest military on earth attacking a tiny helpless strip of land populated by 1.5 million people “packed like sardines” in a tiny space. He called on the city council to boycott the “apartheid state of Israel.” The billions of dollars of aid that have been given to Israel should instead be spent on rebuilding Detroit and the cities of the U.S., he said. Coleman characterized cited a statement he attributed to an Israeli official – stating that Israel would bomb Gaza back to the Middle Ages – as a “Nazi statement.” and said in his opinion that Israel is a Nazi state. Mozhgan Savabieasfahani addressed the council on the same topic as Coleman. [Chronicle archives indicate that she last appeared before the council on July 6, 2010.] She told the council she was there after a long absence, but said she still recognized many of their faces. She drew a laugh when she told them flatly: “You have all gotten a lot older.” She added that to their shame, however, they’d done nothing to stop the genocide of the Palestinian people. She had consistently tried to get the city to boycott Israel, so she had something to show for her age, she said. Today children in Gaza are being bombed – and many parents are mourning the death of their children. She was hopeful that Warpehoski would spearhead a city-wide boycott of Israel and stop arming Israel so that it’s no longer able “to slaughter children.” She asked the council to pass a resolution that called for the cessation of military aid to Israel. Lily Au told the council that she had three items she wanted to talk to them about. The first was that a traffic light is needed on Huron Parkway. The second was a request for a warming center – which is needed, she said, because many people are turned away from the Delonis Center. The third item was a criticism of the coordinated funding approach the city uses to support human services. She contended that it’s not a moral policy and she accused the United Way of paying its staff inappropriately high salaries. Alan Haber greeted the new councilmembers by saying that he hoped it was a creative period for them. He said that some same-old questions persist – for example, about the future of the city-owned Library Lane site above new underground parking garage. Left to right: Stephen Kunselman (Ward 3) and Alan Haber. People want a public place there, Haber said, but the Ann Arbor Downtown Development Authority’s committee has not entertained any notion of a park or an expansion of the small concrete space that had been part of a conference center proposal. [Haber was referring to an advisory committee formed as part of the DDA's Connecting William Street initiative.] He contended that the DDA’s committee had totally stonewalled all comment that supported the development of the Library Lane as a public place. Haber hoped that the council would send back whatever report it received from the DDA’s committee with a request that a public space be considered with various amenities. Haber also noted that freezing weather is approaching and it will be a hardship for homeless people. He contended that the city-owned building at 721 N. Main could be rehabbed for a community center, with no city expense. During the period for public commentary at the end of the meeting, Michael Benson suggested that the council consider reviewing its rules on speaking and reserved time at the start of the meeting. There’s a priority list, he noted, for people to speak on agenda items as opposed to items that are not on the agenda. He essentially suggested that this priority ranking be further refined so that agenda items on which the council is taking action get higher priority than those where the council is not voting on something. Robert’s Rules eschews using the motion to table as a motion to postpone definitely. From the analysis I read here, it is clear that your council would benefit from consulting a professional parliamentarian about the proper use of the subsidiary motions, and not rely upon professionals in law and journalism who do not have specialized training in parliamentary procedure to interpret Robert and to advise on parliamentary procedure. All of them robotically repeated after the City Clerk “I do solemnly swear or affirm….” You affirm if you have some conscientious objection (usually religious) to swearing an oath. You are supposed to say either “I do solemnly swear” or “I do solemnly affirm” – not weasel around and say “I do solemnly swear or affirm”. Tsk, tsk. I am sure there is a major story here. Or not. Not so much. Check the tape. November 19th, 2012 was a historic day in which the “Mayor’s Club” was dethroned as a controlling clique on City Council. It had initially been known as the “Gang of Seven”, later the “Council Party” and the “Mayor’s Club”. (10)continue to hold the line on the salary and benefit packages of the City Attorney and other highly compensated municipal officials. The swearing-in of Sally Hart Peterson and Sumangala (Sumi) Kailasapathy as City Council members are a welcome result of the last election cycle. They bring with them a strong pro-business perspective that City Council had previously been lacking and a fervent desire to serve the grass-roots electorate. Neither has held elected office previously and that likely contributed to their respective landslide victories. Ms. Briere needs to brush up on her history. The City of Ann Arbor and Scio Church Road were both built for pedestrians. The notion that people aren’t entitled to use the roads for walking came along later. Thanks to Sabra & Mayor Hieftje for their kind words :) I would also wonder about myself if I didn’t know me. I am looking forward to serving on the commissions for which I’ve been nominated. I can see the confusion about the historic commission…that is certainly an area I am interested in but there is no way I could serve on that even if the whole city council camped out on my front lawn, singing for me. (That would be AWESOME though!!!) I only mentioned it as a commission that I am interested in, at some point in the future. If any of the concerned council members are reading this, I’d love if they would email me (teacherpatti [at] fastmail [net]) with any questions or concerns. Or come and sing at my house, any time! Anyway, thanks for those who nominated me and I hope I am confirmed next Monday. It took me a while to get around to reading this lengthy post but I want to congratulate you on your background analysis of several procedural issues. The discussion of Robert’s Rules, the meaning of published and unpublished court decisions, and the criticism of AATA’s handling of the opt-out procedure were all much clarified by your explanations. I have to agree with CM Kunselman’s comment about AATA’s adherence to procedure. I was shocked earlier this year to find that they had not troubled to complete the process of enrolling the various township districts into Act 7 agreements. They had stated clearly that this had been done, but when I investigated, it turned out that many had not been finished. I’ve been assured that this was finally taken care of, but they had meanwhile solicited members for their u196 board and carried on as though all those steps were complete. This is not the way government should be conducted. The AATA has had its share of problems and poor judgment. This article also alludes to the AATA lawsuit by Blaine Coleman and the ACLU that is being defended with public funding by two expensive outside law firms in United States District Court in Flint. The Maddin Hauser firm was appointed by the AATA’s liability insurance carrier and the AATA has a $50,000.00 deductible for defense costs. Dave Askins had confirmed that the first month’s legal bill for representation last year was almost $7,000.00 for that firm alone. I am wondering what are the current billings and expenditures for costs and attorney fees to defend this action. The AATA aslo hired a University of Michigan professor as an expert witness at the rate of $250.00 per hour. I also wonder what attempts are being made, if any, to mediate a compromise in the case. Under the Federal Civil Rights Act of 1871 pled in this case, the prevailing party may seek an award of attorney fees as a prevailing plaintiff even with a partial victory – which they have likely already achieved with Judge Goldsmith’s recent ruling on the request for a preliminary injunction. The AATA’s potential exposure in this federal proceeding in attorney fees alone could easily run upwards of six figures. I fail to see what public objective is advanced by the AATA continuing to fight this matter in court. Were they pre-heating the oven to cook the sausage they were making? ;-) I’m thankful for every one of them sitting at the table and what they bring to it. I prefer the latter characterization of seeking office to the former of competing for it. That’s an interesting contrast to the process for the approval of the underground parking structure. re: #3, as a Quaker I chose the option to affirm, not swear. Chuck, as you likely know, the Quakers’ history in Palestine goes back to the 1860s. The Friends School in Ramallah has operated since 1869 and continues to this day as a premiere institute of learning in the West Bank. Mohammed Issa, a Ramallah native currently sits on the Ann Arbor Human Rights Commission and Hani Bawardi, a University of Michigan professor, originally from Nazareth also served on that commission. Local Quakers spearheaded the People’s Food Coop boycott vote against Israeli products in 2007 and several have taken part in the Temple Beth Israel vigils. I look forward to your continued advocacy of peace in that region. congrats,sumi kailasapathy,may your success grow from strength to strength.